Reading with the Reids: Santa photo! Okay, I need/want to see the picture LARGER! I tried clicking on it and it wouldn't show it bigger. HELP! Love?!!?! Oh my...what an angel Robynnator is! Even with an hour at Toys r us...that is AMAZING! Beeeeeeee-utiful babes you have, Miss Auntie Darcey, beautiful!!! I LOVE the picture - your girls look beautiful in their Christmas outfits! Love - that is the sweetest request ever! How about a pretty box full of hearts? And you and Russ could write all the things you love about Robynn on them? 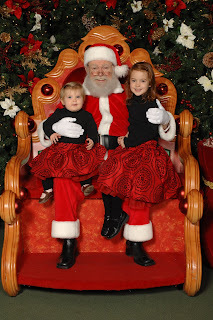 Thank you for the link to last year's Santa picture! I hadn't remembered the details and just about bust a gut remembering how crazy you were in the days after 10 pound baby Natasha was born!!! Last year's blog is awesome, my dear friend! I am so thankful for this blog thing as it helps me to remember my own memories in more detail and then getting to read my friends' is simply icing on the cake!! !